Nisshanka Latha Mandapaya is located in the Polonnaruwa Dalada Maluwa, where the Tooth Relic of Load Buddha was located in Polonnaruwa period. 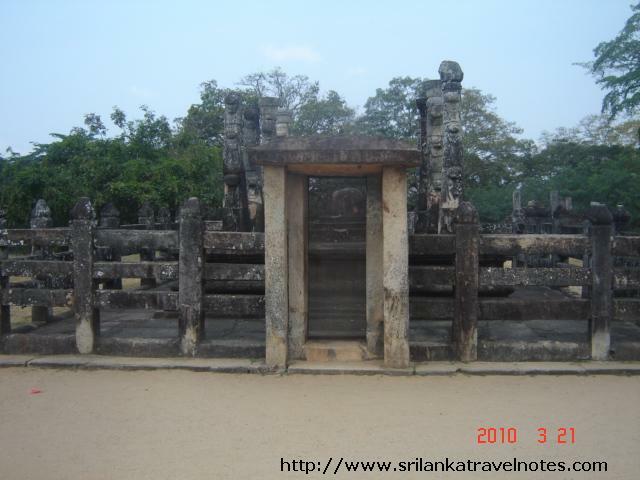 This the place where king Nissanka Malla(1187-1196 AD) used to come and listen the Pirith Chanting. Pirith is a protective Buddhist texts. This pavilion is surrounded by a railing ( fence, Garadhi Weta), which was done with stonework. Entrance is from the east side with a stone doorway. There is a stupa ( Dageba) in the middle of the stage, which was done with stones.There are 8 stone columns, on the stage around the Dageba. These pillars are not straight, have curve(angular) shaped from three places. Each pillar is around 8 feet in height. You can see a Blossoming Lotus at the top of the each stone column. Its believed that the roof was done with wood.